DinoPaint is a fun dinosaur coloring book that helps kids learn all about dinosaurs and other prehistoric creatures. With 30 dinosaurs and other animals (in the registered version), this is a fun and educational way to occupy your kids. Each dinosaur coloring page comes with a Dinosaur Fact File, where you can learn all about the dinosaur - when it lived, what it ate, how big it was, and much more! When you are ready download the free trial. The trial includes 5 free pages plus previews of all the other pages. And when you are ready to register you don't even need to download anything extra, just pay the low registration fee to unlock your existing copy! 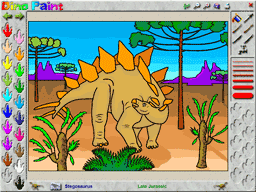 We know you and your kids will love learning about Dinosaurs with DinoPaint. For just $9.95 you get all 30 dinosaurs - plus free upgrades as we add more! DinoPaint is a product of Kea Software. For more great products, check out the Kea Software website. Copyright Kea Software © 2016. All Rights Reserved.